They provide grapes to some of the best producers including Tomassi and Allegrini. The Recchia family have been growers and wine makers in the Veneto since 1906. They provide grapes to some of the best producers including Tomassi and Allegrini. Fratelli Recchia also produces their own Amarone Classico wine from the local grape varieties in their estate vineyards. 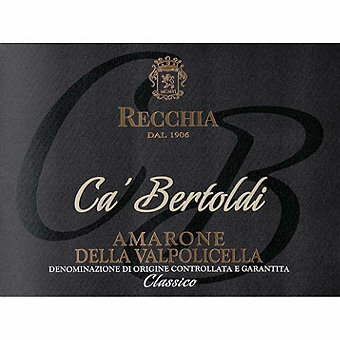 The grapes for this Ca' Bertoldi Amarone Classico come from a small single vineyard next to the winery. Hand selected and dried on straw mats. The vineyard lies at one of the highest points in the region and therefore the drying process is much longer and slower than other Amarones. The grapes are harvested in Early October and dried until late January or February. This allows the grapes to gain richness and intensity without stripping any of the delicate and refined flavors. Fermentation takes place in temperature controlled stainless steel tanks and the maceration lasts anywhere from 30 to 50 days. The wine ages first in stainless steel tanks for 6 months before transfer to oak barrels where it ages an additional 36 months.